An intimate, sparkling collection of stories by a debut writer about girls behaving badly and families on the brink of collapse. In these lucid, sharply observant stories, Mandeliene Smith traces the lives of men and women in moments of crisis: a woman whose husband has just died, a social worker struggling to escape his own past, a girl caught in a standoff between her mother’s boyfriend and the police. A lively and insightful collection, Rutting Season is dark, humorous, and moving, filled with complex characters who immediately demand our interest and attention. In “What it Takes,” a teenage girl navigates race and class as the school’s pot dealer. “The Someday Cat” follows a small girl terrified of being given away by her neglectful mother. “Three Views of a Pond” is a meditation on the healing time brings for a college student considering suicide. And in “Animals,” a child wrestles with the contradictions inherent in her family’s relationship with the farm animals they both care for and kill. In barnyards, office buildings, and dilapidated houses, Smith’s characters fight for happiness and survival, and the choices they make reveal the power of instinct to save or destroy. Whether she’s writing about wives struggling with love, teenage girls resisting authority, or men and women reeling from loss, Smith illuminates her characters with pointed, gorgeous language and searing insight. Rutting Season is an unforgettable, unmissable collection from an exciting new voice in fiction. Mandeliene Smith’s stories have appeared in Guernica, The Sun, New England Review, and The Massachusetts Review. Her work has been nominated for a Pushcart Prize, and her story “Mercy” was selected by Stephen King for the list of “100 Other Distinguished Stories” in The Best American Short Stories 2007. To support her writing habit over the years, Mandeliene has waited tables, weeded gardens, taught writing, worked as a secretary, and translated books into Braille, among other things. She has an MFA from Sarah Lawrence College and a BA in comparative literature from Hampshire College. She currently lives in Lexington, MA with her husband, her two daughters and two dogs. "This short story collection checks off two big marks for a memorable read ... Desperate characters and punchy writing." "Mandeliene Smith's short story collection will appeal to fans of Alice Munro and Marilynn Robinson. The seven stories in this collection are well-crafted gems that peer into the lives of seven women and girls at pivotal moments. With gorgeous prose, Smith incisively uncovers truths of the human condition — and introduces us to some great characters, too." “In Smith's unsettling debut, characters must confront the most basic, animal sides of themsevles as they navigate crisis and tragedy, whether it is a husband's sudden death, workplace tension, or a police faceoff ... Smith's characteres skate the razor-thin line of brutality in a way that's both chilling and compelling ... This collection proves that Smith is an uncommonly talented writer with a particularly sharp eye for the serrated edge of human nature." "Smith’s wrenching first collection features characters encountering indelible, complex shifts in their lives and relationships ... Characters have little choice but to confront their difficulties and ghosts head on, and Smith’s nine tales sharply convey their internalizations as well as the glimpses of acceptance they so desperately seek." 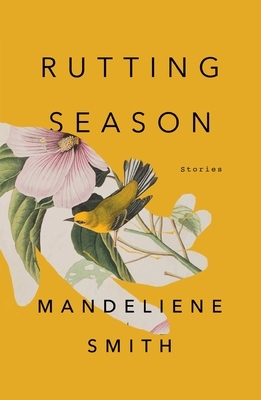 "The lyricism and gritty naturalism that inform the haunting, extraordinary stories in Mandeliene Smith'sRutting Season bring to mind the dark, incisive vision of Joyce Carol Oates where love and cruelty commingle with often crushing force. Smith is a master of pathos and the casual terror of the everyday. Her characters are vibrant, flawed, vulnerable, and above all, wholly memorable." "Mandeliene Smith's stories are empathic, wise, and do not look away from uncomfortable truths, whether they be about black-white race relations, the necessary cruelty of life on earth, or the pervasiveness of loss. This is a beautiful, sensitive, and sophisticated debut."